For a recent birthday, our oldest wanted to go to a movie with a handful of his friends. After driving around picking them all up, we were on our way. One minivan, one middle-aged dad, and five 15-16 year olds. No sooner were their butts in the seats than the devices came out. At first it was a typical scene of a bunch of kids “alone together” staring at their own screens. This was the first moment where I had a choice to make. Do I jump in and go all parent on them? Tell them to put away their phones and actually talk to each other. Then one of them began sharing “those videos” in my car. No, not those videos. The other kind of videos boys sometimes gravitate towards: violent and stupid ones. I could taste the blood from my bitten tongue. Don’t get me wrong; it wasn’t a case of being afraid of saying something or feeling I was somehow out of place to moderate other kids’ behavior. I mean, I’m a teacher and school librarian. I step in and tell kids what to do all the time. It’s an occupational hazard for me. And it’s my car, darn it. My rules. And these are good kids and we know their parents. The kind of parents that would expect us to say “stop doing that” when needed. Just like we hope they do when our kid is in their car. For some reason, though, I stayed silent and waited again. It could be, of course, that he was just saying that because Dad was in the car. But have you been in a car with a bunch of teens before? It’s like they forget there is an adult in the vehicle at all. Like it’s a robot car shuttling them to their destination. Huh. That’s what I was going to say. Any time I hear the word challenge association with any social media, my ears perk up. Reddit is a social media site that allows users to post news, articles, and other findings from the web, including their own content. “Redditors” can start discussions about these posts and rate them. Later, I dug a little deeper to find that this challenge encourages users to choose between two links: one that is innocent and pleasant, and another that is violent, disgusting, or completely inappropriate for most audiences. The “challenge” is to keep making choices, over and over, and see how long you can “endure” the inappropriate stuff. In learning about this, I discovered some other challenges, too. Such as another either-or challenge called “Boobies or Kittens.” Oh, charming. Yes, of course there is a limit to tolerating this, to staying silent. There is that vague line that, if crossed, we certainly need to intervene…in a calm manner. There are behaviors, especially online ones, that need to be addressed and corrected as our children continue to navigate their digital world. But we can go too far with our reactions and the speed with which we jump in. In fact, that is one of my greatest fears as a digital parent: My children won’t feel comfortable coming to me to talk about what is happening around and to them online. I was also reminded of another important thing that we need to keep in mind as we are raising our kids. We can lock down their devices and install filters. We can turn on every parental control and set all the monitoring features on their phone with our carrier. We can even take their phone away during certain times. Like car rides to the movie. But their friends will have devices. Or they will have internet access somewhere else. Or they will be drawn into a conversation that started online but quickly moved offline and escalated. So, we need to teach them to be their own filter. We need to instill in them the right judgments to make in the moment. We must model and teach them the language they need to respond to certain situations they will face. And we need to give them the “why” behind every expectation we have for them, so they can apply that value in a new circumstance. This is a deliberate conversation on our part, as it will not happen by accident. We need to make these issues (friendships, tech “addiction”, inappropriate use, positive apps, etc.) a part of our regular, everyday chats with them. It’s not all about us being the teacher, however. We also need to be willing to be the learner: to be students of our kid’s world, their behaviors, and their peers. We have to be open to getting to know what is going on in the world they are living in. 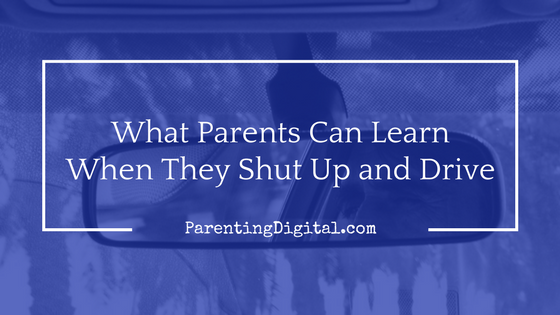 Sometimes, the best way to do this–especially in noisy car rides–is to shut up and listen.